We have three things to thank for New England’s bevy of mountain beauties: geomorphic forces dating back millions of years, a burgeoning ski industry desperate to fill summer hotel rooms, and the invention of the golf cart. We’ll skip the geology lesson, fascinating as it is. Suffice it to say that the Laurentide Ice Sheet was the kind of shaper any course architect would love to have on staff. And the benefits of the gas-powered cart are apparent enough—especially when you’re faced with a 60-foot vertical climb to the next tee. 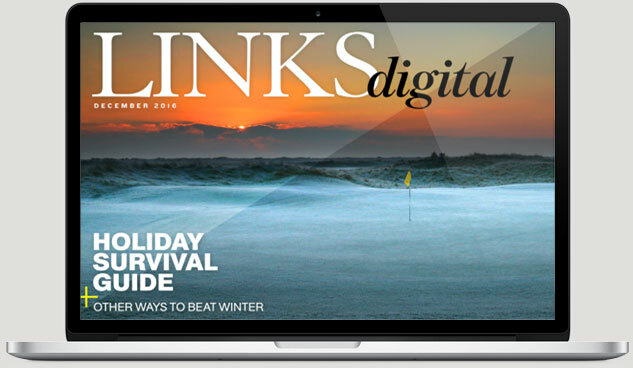 But were it not for the legions of skiers who annually descend on New England’s ski resorts, golf might never have taken root in the region’s higher elevations. And what a shame that would be. Because nestled in the hills are no end of thrills—along with some of the most jaw-dropping surroundings you’ll ever take a drop in. It’s a difference to savor. Things like factoring constant elevation changes into your club selections and judging how mountainside putts will break make the game more fun. And, fortunately, New England is blessed with enough spectacular mountain tracks to make you all but forget about sea-level golf—especially when the autumn leaves are doing their thing. Here are some of the courses and resorts you should put high on your list, appended with “slope” ratings that both golfers and skiers can appreciate. Taconic Golf Club, Williamstown, Mass. 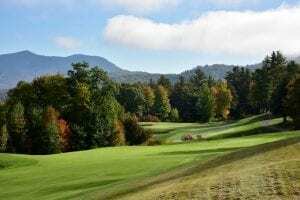 Massachusetts doesn’t have much in the way of mountains, but the foothills of the Berkshires were put to excellent use by Stiles and Van Kleek at Taconic. 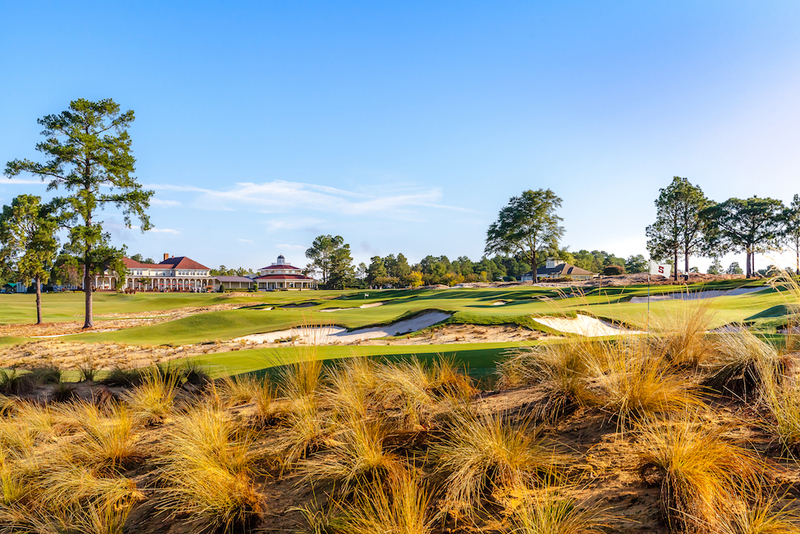 This classic college-owned course (renovated by Gil Hanse in 2009) is deceptively difficult, with often-elevated tee shots giving way to treacherous greens. 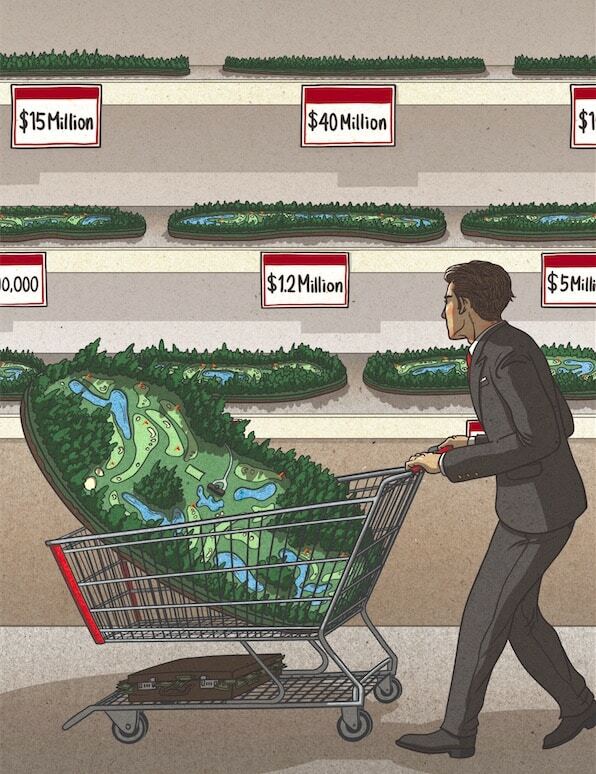 Hint: don’t go long. Massachusetts isn’t mountainous, but the Berkshires do offer up one good option at Cranwell. This stately property dates back to the Gilded Age and features a topsy-turvy, Stiles and Van Kleek course that offers stunning views of the resort’s historic buildings and neighboring hills. Another historic property, the Mount Washington Resort sits in the shadow of its towering namesake (New England’s highest peak). Its 1915 Donald Ross course was restored in 2008 by Brian Silva and is a joy to play, with a particularly strong group of mostly lengthy par threes. The grand hotel is as luxurious today as it ever was. 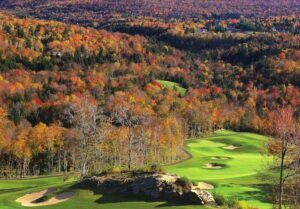 The only Jack Nicklaus-designed course in the Granite State, Owl’s Nest makes the most of its White Mountain location, with dramatic elevation changes, sloping fairways, and lots of OB to keep you on your toes. The views you’ll enjoy on many holes, especially the par-three 14th, called “White Birch,” are worth the visit all by themselves. In the pantheon of New England’s grand hotels, none stands prouder than The Equinox. Dating back to colonial times and elevated to a higher level of luxury than ever, The Equinox offers everything a visiting golfer could want—including a Walter Travis design (restored by Rees Jones) that you’ll never tire of taking on. The two nines play down from the clubhouse then back up, with thoughtful holes throughout, in particular the 423-yard, uphill 13th and strong 417-yard finisher. The resort’s spa, sitting at the foot of Mt. Equinox, tallest of the Taconic Mountain chain’s peaks, is splendid, as are the guest rooms, dining, and service. And if you can wrangle a tee time at famed (but private) Ekwanok Country Club next door, you’ll really be in heaven. Killington is one of Geoffrey Cornish’s homages to mountain golf (Stratton being another). The course reaches elevations as high as 2,000 feet and features generous fairway landing areas, undulating greens that require strategic approaches, and incredible vistas. You’ll seldom find a flat lie here, but the holes are flat-out fun. 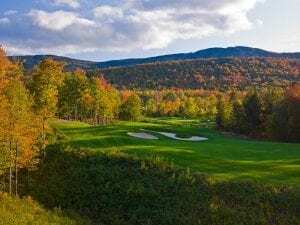 The Stowe Mountain Club is private, but guests at the Stowe Mountain Lodge can play its course and shouldn’t miss the chance. Bob Cupp did 18 routings before settling on this one, and you won’t find a better collection of mountain golf holes. Nestled between Mount Mansfield and Spruce Peak in the heart of ski country, this is mountainside golf, with delights and surprises at every turn. The sharply uphill par-four 14th, with its tiny green overlooking Stowe Valley and Peregrine Lake, is unforgettably scenic and fun. The Lodge is equally wonderful, with beautiful guest suites, exquisite dining, and one of New England’s best spas. Next door, The Spruce Peak Performing Arts Center has a full summer schedule of entertainers that will make your visit even more memorable. 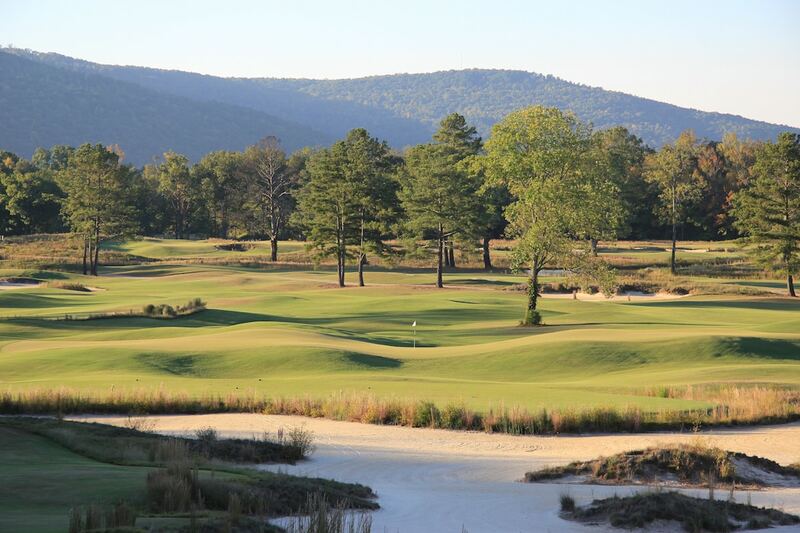 You haven’t lived until you’ve played 10 and 11 at Sugarloaf, an RTJ Jr. design that has earned the highest accolades since it debuted. 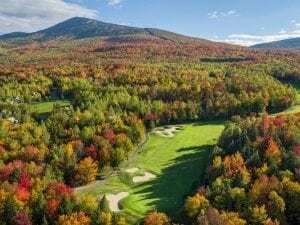 Both have you hitting from high perches to targets 100 feet below, and both offer views of the neighboring hills and tumbling Carrabassett River that have to be seen to be believed. When the holes here are not going down like ski slopes, they slice along and across the mountainside, testing your balance as well as your judgment. This tough but thrilling course is only a drive and a wedge from the Canadian border, but well worth the trek. I’ve saved the best for last. Sunday River, another chart-topper from RTJ Jr., ticks every mountain golf box. 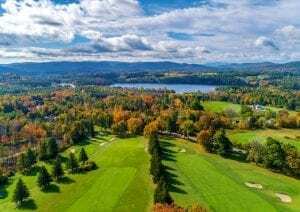 Frequent elevation changes, generous fairways that give way to challenging greens, and an ingenious routing that seems to take you across three counties all make Sunday River endlessly enjoyable. You’re surrounded by mountain peaks and ski trails all day, but you’ll give thanks that it’s golf season with every swing.